Tooth whitening. For a brighter, healthier smile. As we get older so do our teeth and they naturally darken or turn yellow. Some patients just have dark or yellow teeth. If you would like to whiten or lighten the color or your teeth the tooth bleaching is an option for you. We currently do not fully understand how it works but it does. Studies have shown tooth bleaching to be effective and safe. All systems today use a form of peroxide to lighten the teeth. Depending on the formulation and strength of the solution it can be applied at home, in the shopping mall or dental office. The most common side effect is tooth sensitivity and you don’t want to apply it to teeth with existing decay. With any system the usual result is to lighten your teeth up to two shades using a standard vita shade guide. The systems designed for home use a mild solution and can be directly applied with a brush or other device and your teeth will get lighter. What is offered at the shopping mall and spa’s is another version of the home type solution applied under a light. The key opinion leaders in dentistry all agree that the light is a marketing tool and does not improve the bleaching results. The most predictable way to bleach your teeth is under supervision of a dentist. The dentist will identify if the discoloration is caused by decay and if you are a candidate for bleaching. Depending on your clinical presentation your dentist may start you on a mild to moderate concentration or jump into the stronger solutions for faster results. Often a dentist will take dental impressions and make a specific carrier to apply the bleaching solution. 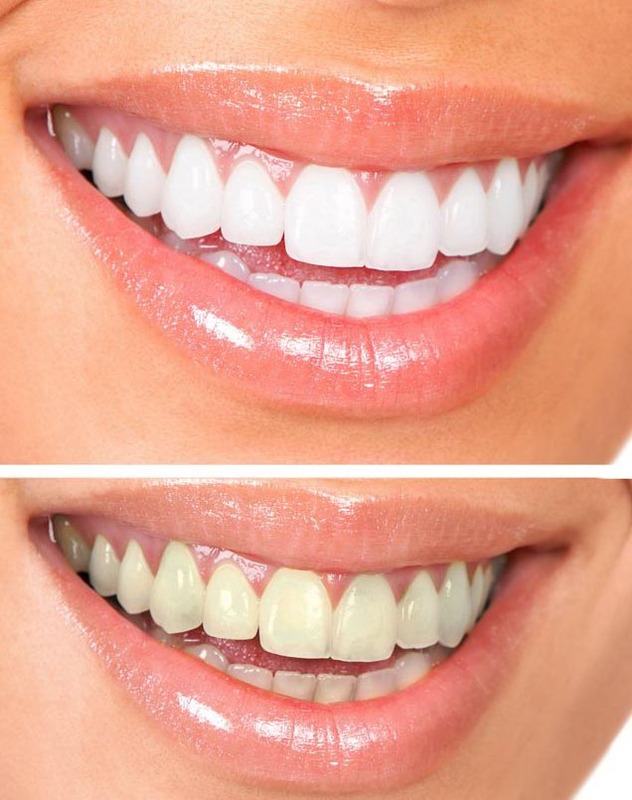 The cost for professional bleaching can vary from $150.00 to $600.00 for both arches. In my Levittown and Commack offices the average cost for the full mouth is $300.00 and this includes the bleaching trays, exam and consultation. You, like many other people, may not be happy with the color of your teeth. If your teeth are discolored, you may feel self-conscious about your looks. The good news is that you no longer have to settle for discolored teeth because tooth whitening can help reduce most discoloration and improve your smile. In-office whitening is done in my dental office with professionally applied tooth whitening products only available to dentists. This is method can be done in just one office visit and can usually give the whitest smile. Home-use whiteners can be dispensed through my office for use at home. Your teeth will become whiter and whiter over several days or weeks. The ADA recommends that you only use a bleaching product after talking with a dentist. This is especially important for patients with many fillings, crowns and dark stains. We need to examine your teeth carefully to see if bleaching is the most effective treatment for you. Then we can plan your whitening treatment. There is such a thing as too much whitening. Do not use whitening products for longer than the product directions or your dentist tells you. Overwhitening can cause severe discomfort to your teeth and gums. If you would like to learn more about whitening your teeth, please contact our office today at (516) 796-6600 or Marc@AnxietyFreeDental.com.